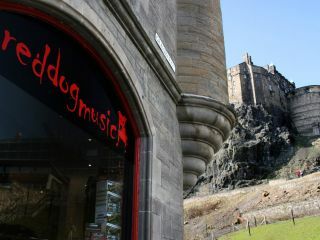 Red Dog Music, situated in the shadow of Edinburgh Castle. Red Dog Music, Edinburgh's largest instrument store, has announced plans to publish its own free music magazine. The mag, entitled The Dog, will be launched with an event of local live music, DJs and art to take place on October 28th at The Caves in Edinburgh.For a full line-up for the event check out the Facebook event page. In addition to the launch party Red Dog plan to host a number of new regular events including week night music clinics, Hair Of The Dog Sundays featuring in-store gigs by local artists and regular open jam sessions. For more info visit the Red Dog site or email info@reddogmusic.co.uk.